Check out Samsung Galaxy A8s full specifications, features, pros & cons and availability dates. 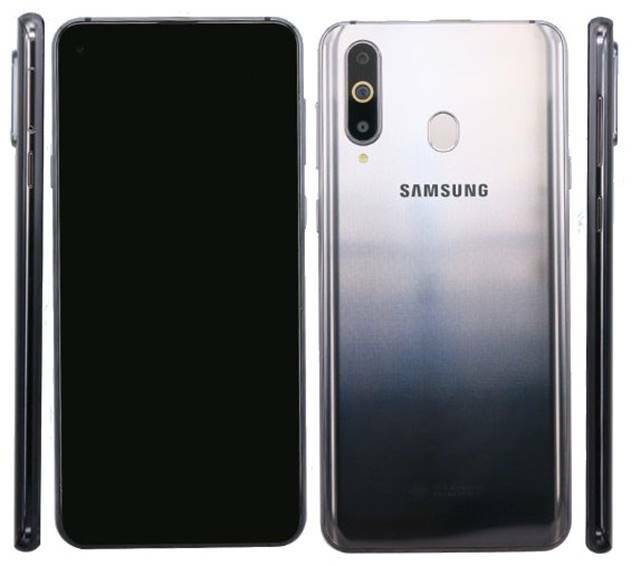 Samsung Mobiles, the South Korean smartphone giant who is leading the Android smartphone segment is all set to introduce yet another budget range smartphone and it will be called as the Samsung Galaxy A8s SM-G8870. It received the FCC certification last month and has according to the listing it comes with a 6.39-inch display with 2340 x 1080 pixels and a 2.5D curved glass display. Under the hood, it will be powered by an Octa-Core Snapdragon 710 10nm Mobile Platform (Dual 2.2 GHz Kryo 360 + Hexa 1.7 GHz Kryo 360 CPUs) with Adreno 616 GPU with 6 GB RAM and 128 GB inbuilt storage. In terms of camera, we have a 24 mega pixel rear camera with LED flash, f/1.7 aperture, 10MP 120° Ultra Wide camera, 5 mega pixel f/2.2 depth camera and on the front there is 24 MP front camera with f/2.0 aperture. Dimensions, as mentioned, are 158.4×74.9×7.4 mm. It includes 4G VoLTE, Wi-Fi 802.11 ac (2.4/5 GHz), VHT 80, Bluetooth v5, GPS + GLONASS, USB Type-C, NFC feature and 3400 mAh battery with a 5V-2A/9V-1.67A adaptive charge. Samsung once again vows to take on the mid-range flagship killers like PocoPhone F1, Vivo V11 Pro, Huawei View 20 and OnePlus 6T. Samsung Galaxy A8s Price is said to be around $499.